Hispanic Heritage Month is an opportunity for all children to learn more about the culture of Spanish-speaking countries. Students who are fortunate enough to study Spanish learn about these countries and cultures in class, but not all children have that opportunity. Everyone can play these 5 Hispanic Heritage Month games. Kids may learn a few words, but they don’t have to speak Spanish to have fun playing. Why These Hispanic Heritage Month Games? First, these Hispanic Heritage Month games are traditional. They have been played for generations and are an important part of the culture. In addition, there are some simple Spanish words in all the games, but children don’t have to speak Spanish to play. At most, they need to learn to say one simple phrase. These games are also fun for children of different ages and at different language levels. Finally, the games involve little or no cost. This traditional game is played with a wooden top called a pirinola in Mexico. It is called a perinola in some countries. The six-sided top has with instructions on each side. I included the pirinola in my list of Hispanic Heritage Month games because in addition to being fun to play, kids will pick up a couple of very useful Spanish verbs. The phrases on the top are simple and you can list them on the board with their translations. You can make your own pirinola from cardstock or light cardboard and a pencil. The pencil goes through the center. There is a link to a download of a printable pirinola below. The traditional wooden tops are also available in many Latino markets in the U.S. and you can purchase them from Amazon. Download a printable pirinola that spins on a pencil. Check out Toma Todo Game: La Pirinola for printable Toma todo spinner and more information about the game. The game can be played with two or more players. Each player needs about ten tokens. We use beans, but kids sometimes play with candy. Everyone puts one token into a center pile to start, and then one player spins the top. When it falls, the player follows the instructions facing up. Toma uno. – Take one (token from the pile). Pon uno – Put one (in the pile). Toma dos. – Take two (tokens from the pile). Pon dos – Put two (in the pile). Toma todo. – Take it all (the whole pile). Todos ponen. – Everyone puts a token in the pile. When toma todo comes up, the player takes all the tokens, so for the game to continue, everyone must put one token in the pile. Play continues until one person has all the tokens. This is a very simple game, and it can be played inside or outside. Kids jump from one side of a line (mar) to the other (tierra). To play, kids line up beside a line on the ground, so that they can jump sideways over the line. One side of the line is mar and the other side is tierra. One person who has been chosen to call first calls out mar and tierra as the players jump across the line (or in place) to be on the correct side. You can see videos of the game here. I included Mar y tierra in my list of Hispanic Heritage Month games because kids can play this authentic game by learning to recognize only two words. Before you play, practice saying the words together as a group as you jump side to side. 1, 2, 3 Calabaza is a playground game kids play in Mexico. In South America, this game is 1, 2, 3 Momia es. It is 1, 2, 3 Escondite Inglés in Spain and in English it is Red Light, Green Light. 1, 2, 3 Calabaza makes my list of Hispanic Heritage Month games because it is active, fun and the only language kids need to learn is 1, 2, 3 Calabaza. To play, one player (the leader) faces a wall or a tree (the base) with the rest of the group behind her at a distance. The group tries to move forward while the leader’s back is to them. The leader says Uno, dos, tres, calabaza (Un, dos, tres momia es), spins around, and tries to catch someone moving. Everyone must stand perfectly still, like a pumpkin (or a mummy) while the leader is watching and if someone moves, that person must return to the starting line. The first person to reach the base takes the leader’s place. You can see a video of kids playing 1,2,3 Calabaza here. Pares y nones means evens and odds (numbers). This traditional game is played with groups in Mexico. Everyone joins hands in a circle and walks singing the song. Then, the leader (teacher) calls out a number and everyone hurries to form a group of that number. 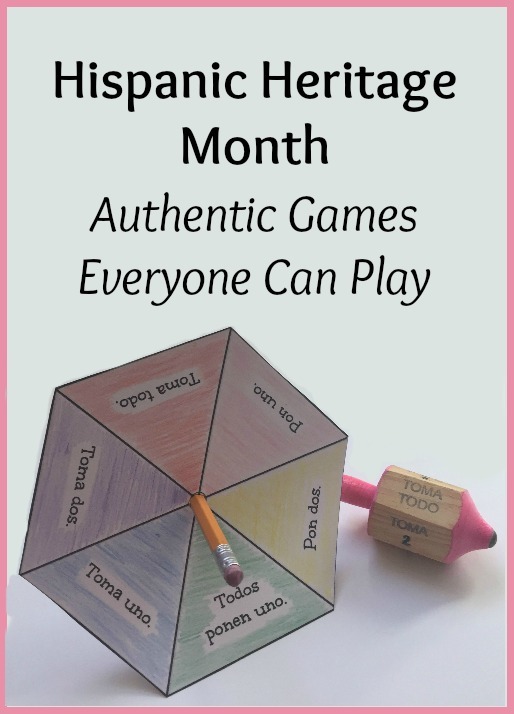 This game makes my list of Hispanic Heritage Month Games because it is fun and uses low numbers that most children know or are happy learning. This video shows the game with groups of different ages, so you can get a good idea of how it works. These are words to the song you can hear it in the video, but you can play the game singing any short song. I was working at a summer camp in Mexico and we played singing Limón partido. If you are playing with children who do not speak Spanish, you can sing a simple counting song like 10 deditos. vamos a jugar. / We are going to play. solo quedará. / will stay alone. Lotería is the Mexican equivalent of Bingo. You play the same way, using a traditional set of cards with pictures and words, instead of numbers. Lotería makes my list of Hispanic Heritage Month games because most of the words are common vocabulary and the pictures are Mexican icons. Players see the picture and the written word, so children who don’t speak Spanish can play too. It is a great way to learn Spanish vocabulary! In Mexico, lotería is often played with dry beans for markers. You can print traditional lotería cards free online. You can also purchase them from Amazon. These Hispanic Heritage Month games are one way to bring culture, and a little language, into your home or classroom. Wherever you are celebrating, Hispanic Heritage Month games, music and books can inspire children to continue to learn about these cultures and about the Spanish language. ¡Fabuloso! I would love to be selected! Enseñando y celebrando nuestra cultura con mucho orgullo! Super, que padre que ponen todos estos recursos juntos!